Our contributor, Christine, has a great Valentine’s craft to share with you this week! I love how fun and simple this idea is and a perfect way to dress up any Valentine’s Party! You could also use redhots, gummy candy hearts, or any other fun Valentine’s Themed candy! Thanks for sharing Christine!! 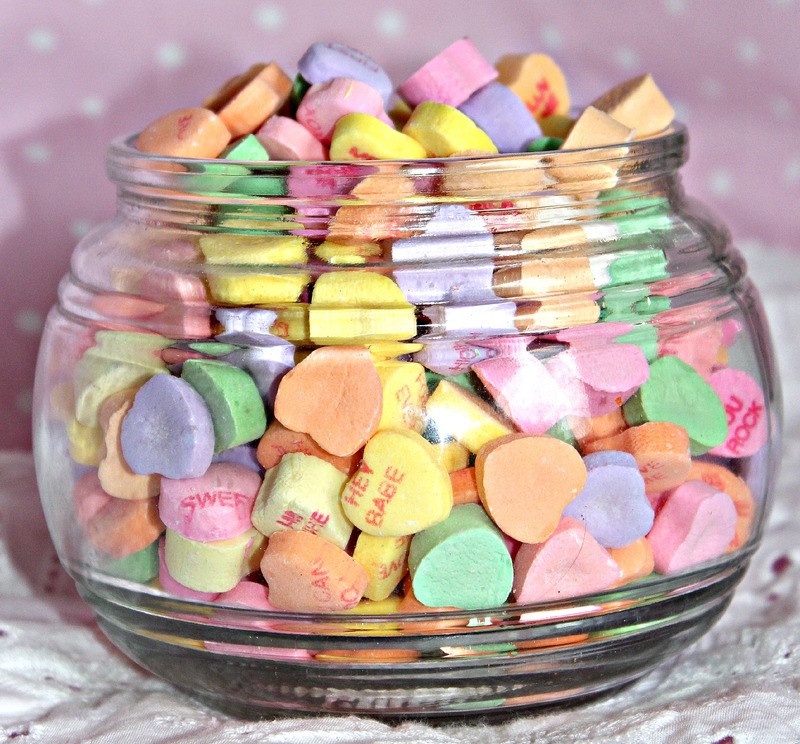 I am putting together a Valentine’s tea party for my four year old daughter and some of her friends and I’ve decided to incorporate conversation hearts into the decor. Elly loves pink so we will of course have lots of pink at this gathering, but I like how the hearts allow me to add some non-pink colors into the mix. Also, this is the first party that she’s requested to be “GIRLS ONLY MOMMY”! My little girl is growing up…but I am still setting a place for little bro at the table. I know he won’t want to miss his first tea party! I made these conversation heart trees so that I can use them to decorate the food table. Don’t worry, I will let those sweet girls know they aren’t for eating! They are simple to make and it was kind of relaxing sitting and hot gluing all those hearts. My kids had fun sorting the hearts and Elly had fun asking me what each one said, although I don’t want to hear my daughter saying lots of those phrases until she’s happily married of course. I bought the toppers from Hobby Lobby not knowing how I’d use them and they turned out to be perfect for this project. I love when that happens! Have fun and try not to eat too many candy hearts! They aren’t my fave so I have lots leftover, but if they had been made of chocolate I would have been in big trouble. Stop by and visit Christine’s blog The Real World: Wilmington to get to know her and her sweet family a little better!